Be careful when deleting guides! 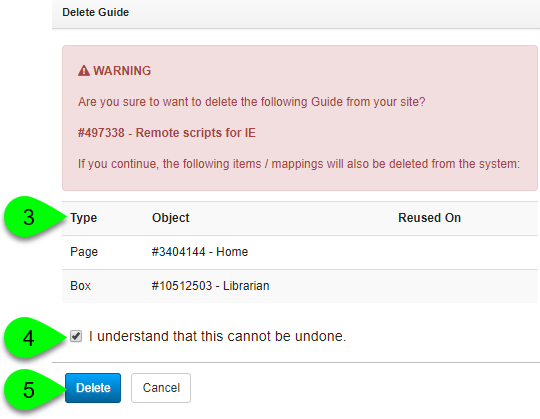 Deleting a guide will permanently remove the guide from your system and cannot be undone. 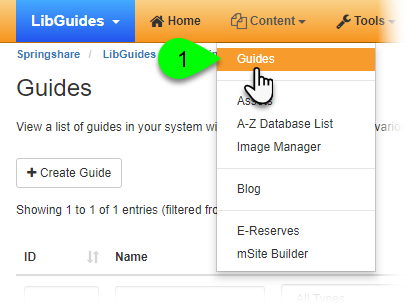 When deleting a guide, all Link, Media/Widget, Book, Document/File, RSS Feed, Poll, Remote Script, LibAnswers Widget, and LibWizard Item assets will remain in your assets library, so can still be used. However, all pages, boxes, and rich text/HTML content items will be deleted. If they were being reused in other guides, then they will no longer appear. 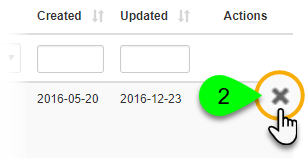 Statistics for deleted guides are retained and will appear in reports with its original ID number and a title of [deleted]. An HTML backup is automatically created when a guide is deleted and can be viewed under Tools > Data Exports > Guide HTML. Although you cannot restore a guide from a backup, the backup can help you to recreate the deleted content in a new guide. If content from the guide is being reused elsewhere, or if you are just hoping to hide the guide from the public without completely deleting it, consider changing your guide's status to Unpublished, instead. Go to Content > Guides. Find the guide you want to delete and click on its Delete () icon in the Actions column. This option will only appear if you are the guide's owner, or an Admin-level user. 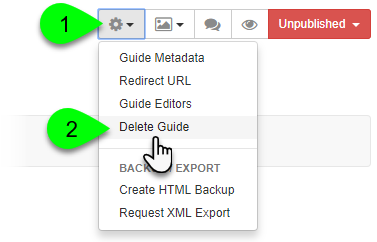 When the Delete Guide window appears, take a moment to review the summary of content that will be deleted. This list will indicate if any of the content on that guide is being reused in other guides. If it is, please note that deleting your guide will also remove that content from those guides. To continue, click on the I understand that this cannot be undone checkbox. While editing your guide, click on the Guide Information () button. Select Delete Guide from the dropdown menu.